On April 25, 1983, a new colt was born at Indian Creek Equine Center. He was named Hickory’s Country Gold after his sire, Golden’s Red Hickory Star, and his dam, Amy’s Country Sunshine. Little did his owners realize the impact that this little one would bring to trail riding competition. Time passed, and the colt grew strong, showing great promise with his foxtrot gait and willingness to perform. 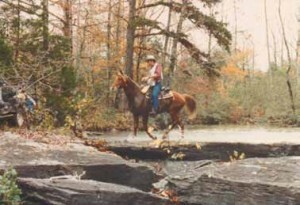 In 1987 and 1988, Country Gold began his career with the North American Trail Ride Conference (NATRC) by competing in five novice rides, receiving three firsts and two seconds. In 1989, Country Gold went open and won sweepstakes (high point open horse) for his first ride and completed the year with five firsts and one third for a total of six rides. Rides with two firsts and two seconds. It is common to see twenty to twenty-five percent of Region Six year-end awards being given to descendants of Country Gold. When Country Gold began his career he was surrounded by many good Arabian horses. Having a Missouri Fox Trotter horse compete was considered an impossible task since Arabians were believed to be stronger with more endurance. This soon proved to be untrue, and Country Gold quietly moved into the winning ranks. There were times his rider had to convince the judges that his horse was not lame and what his horse was doing was a fox-trot. Now that is never a problem because most rides have many Missouri Fox Totters, and judges understand the gait. Country Gold competed in open for nine years, and during this time of competition he won all of the awards that NATRC had to offer. He earned nine National Championships in nine years with a record of 43 firsts and 22 seconds out of 80 rides. He accomplished this when points were deducted for pulse and respiration counts above 12 and 6 respectively. Now pulse and respiration thresholds are more lenient at 12 and 9. Country Gold achieved five top six Bev Tibbitts Grand Championship placings, winning it in 1991 when he had six firsts and six seconds and winning again in 1995 when he had five firsts and five seconds. Country Gold won the President’s Cup (Sweepstakes Award) in 1994, along with the Jim Menefee Memorial Award (combined horse/horsemanship), National Overall Heavyweight horse, the National Overall Heavyweight Horsemanship (Bruce Becker Memorial) and National High Point Missouri Fox Trotter in 1989, 1990, 1991, 1992, and 1994. He won the first Championship Challenge ride in 1995. In 1996, Country Gold was inducted into the NATRC Hall of Fame Horse; the only stallion presented this award. Over the nine years of competition, Country Gold also won three top six Polly Bridges Memorial Awards (high average), four top six National Overall Heavyweight Horsemanship awards (Bruce Becker Memorial), three top six National Overall Heavyweight Horse awards, one Region 6 Linda Telling-ton Jones (high average) award, one endurance ride Best Condition, and the first NATRC All-Around Champion-ship, along with numerous Region Six honors. At the end of the 1997 ride season, Hickory’s Country Gold was retired. His miles in competition totaled 5050. Country Gold and his descendants have achieved 41 National Championships. Eighteen horses with Country Gold breeding have finished in Championship Challenge Rides with two firsts and two seconds. It is common to see twenty to twenty-five percent of Region Six year-end awards being given to descendants of Country Gold. Along with NATRC showing, Country Gold also pulled a carriage in weddings and showed in many parades. In one special Christmas parade, he was a “reindeer” pulling the sleigh carrying Santa Clause. He was a “reindeer” because he had a ten-point antler attached to his bridle. On July 5, 2010, Country Gold showed signs of colic and his vet was immediately called to the farm. He was examined and treated and all day and into the evening he showed signs of improvement. On the morning of July 6, 2010, Country Gold had passed away due to a twisted intestine. This great horse will no longer be running in his pasture with his golden sorrel color shining in the sunlight. He will no longer come running up to his feed bucket for his special ration. His descendants, though, will carry on his winning tradition. 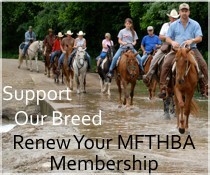 It is said that a man is lucky to be able to ride one good horse in his lifetime. Since Country Gold’s retirement, his offspring living at Indian Creek Equine Center have achieved 12 National Championships with 20 additional championships earned by offspring that the Center has sold. Country Gold has a heritage that will continue for years to come. There is something about the magnificence of a horse that is good for a man’s soul. Country Gold has filled this magnificence by being a horse of a lifetime.